What is Roundup and how does it kill your plants? 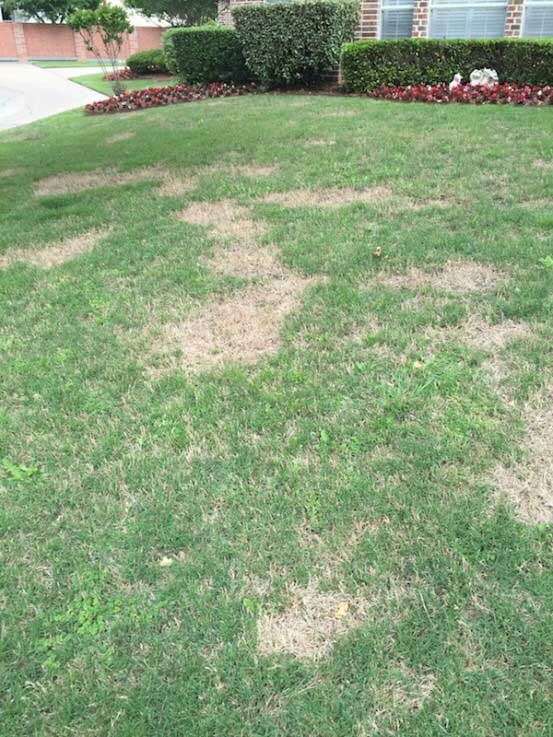 During a recent landscape inspection, it quickly became apparent what was wrong with this lawn: Herbicide damage. We know that weeds can be extremely frustrating; especially when we’re getting a lot of rain and they seem to be taking over your landscape! While we promote the use of organic and natural methods to boost the health of your lawn, we know that sometimes you may resort to a chemical herbicide. Persistent weeds in hardscape features like sidewalks and driveways can be a challenge to control. However, if you do resort to an herbicide like Roundup, you should know exactly how it works and what it kills before you start applying it; or you may end up killing a lot more than weeds. The homeowner applied Roundup to kill weeds in the lawn, but didn’t realize it would also kill surrounding turfgrass. Roundup is what we call a “non-selective herbicide”. That means it can kills any plant it comes in contact with, including all lawn grasses, perennials, annuals, shrubs, vines, etc. Roundup’s active ingredient is Glyphosate, which you may now find in many other brands of herbicides. Glyphosate inhibits plant enzymes that are used to create amino acids. Without these amino acids, the treated plant will die. It is absorbed through the leaves and minimally through roots. When you use a non-selective herbicide like Glyphosate, you have to be very careful that you only apply it to the plant you intend to kill. Even a few unintended drops on a neighboring plant or surrounding lawn will cause damage and even death. You should never apply herbicides when it’s windy, or you may end up with a lot of collateral damage. Many homeowners and uneducated lawn care companies often spray herbicides like Roundup into their lawn to kill late winter and early spring weeds. They wrongly assume that because the warm-season lawn grass is dormant that the herbicide won’t hurt it. Unfortunately, turfgrasses like Bermuda, Zoysia and St. Augustine don't typically go completely dormant in the winter. That means they can still be damaged by herbicides in the “off season”. You won’t realize how much damage is done until the remaining lawn (what’s left of it) starts to emerge in spring. If you unknowingly damaged your lawn with an herbicide like Roundup, you’ll have to do some physical renovation to the lawn. You’ll want to go ahead and remove the dead areas of lawn before more weeds move in to take its place. Then re-sod the patches or re-seed the areas, depending on the type of grass in your lawn. As we always say, a healthy, vigorous lawn growing in healthy soil will naturally suppress a majority of weeds without the need for chemical herbicides like Roundup. Because chemical fertilizers and pesticides can damage soil life and wildlife, we always prefer to avoid them. If you are currently on an organic lawn care regimen or on our Soil Building plan, know that you’ll probably need to remove some weeds by hand. The best results for a naturally gorgeous lawn come from a long-term commitment and a bit of patience. Questions about your organic lawn and garden? Chat us up on Facebook and Twitter.